MSNBC's future involves going back to its past. The cable news channel is contemplating another batch of schedule changes that will prioritize breaking news over progressive opinion, according to people involved in the planning. Several political talk shows are likely to be shelved. Former political anchor Chuck Todd is expected to be coming back for a weekday news hour. And the chairman of both NBC News and MSNBC, Andy Lack, is promising closer integration between the two. The shakeups will bring MSNBC back to its late 1990s roots as a straightforward news channel, at least during the daytime. "Morning Joe" will continue in the mornings and "The Rachel Maddow Show" will continue in the evenings. Staffers at the cable news channel are abuzz about the expected changes ahead of a Thursday morning town hall meeting by Lack. But no final decisions have been made, and Lack will not be making any specific scheduling announcements on Thursday, a spokesman for Lack said Thursday. Lack will talk directionally about a heavier daytime focus on breaking news stories and closer collaboration with NBC News. That's how MSNBC started in 1996, back when Lack was the president of NBC News. The two operations -- network and cable -- shared anchors, correspondents and resources. But some of that sharing went away as the channel adopted a liberal personality in the mid-to-late 2000s. The channel's ratings surged for a while -- which some have credited to President Obama's election -- but have recently cratered, leading the channel's bosses to rethink the liberal tone of its daytime and prime time programs. MSNBC is not moving away from its "lean forward" branding altogether, but instead is trying to compete more aggressively with CNN on day to day news coverage. As previously announced last month, suspended anchorman Brian Williams is about to rejoin MSNBC as an anchor of breaking news coverage and special reports. 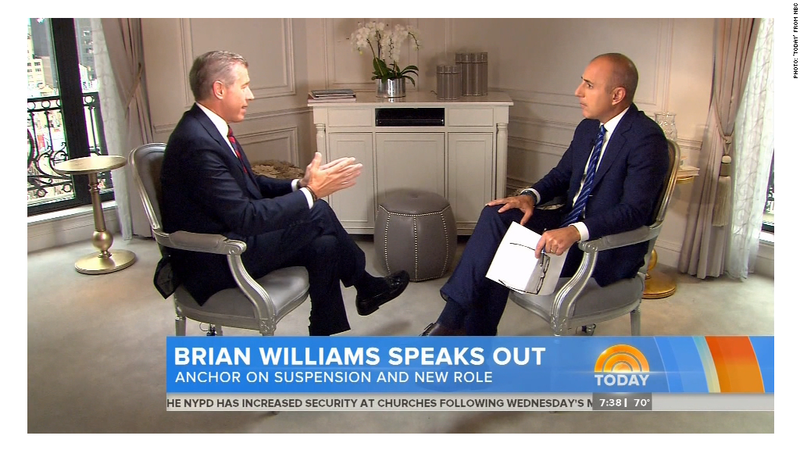 NBC decided not to reinstate Williams as the anchor of the "NBC Nightly News," and Lack is sure to face questions about the move to cable. Williams' six-month suspension ends in mid-August, so he could start on MSNBC anytime after that. But his start date could slide to September, according to the people involved in the planning, partly due to the other changes that are in the works at MSNBC. One big story in late August will be the tenth anniversary of Hurricane Katrina, which would be complicated for Williams to cover, since questions came up in February about whether the anchorman exaggerated a detail about seeing a dead body in the aftermath of the storm. In September there will be a big event that's logical for Williams to anchor: the Pope's visit to the United States. Lack and other executives want some of MSNBC's schedule changes to take effect before Williams starts. Already the 1 p.m. ET and 2 p.m. ET hours, hosted by Ronan Farrow and Joy Reid, have been replaced by "MSNBC Live," a newscast anchored by Thomas Roberts. The same sort of news coverage will move into the 3 p.m. and 4 p.m. hours, Mediaite reported on Thursday, and Todd will move into the 5 p.m. hour. One of the sources for this story described the same scenario. In that scenario, virtually every hour of MSNBC's daytime lineup will have been revamped, with the exception of veteran NBC News correspondent Andrea Mitchell's long-standing hour at noon. It remains unclear whether Williams will ultimately end up with a high-profile time slot on the channel, such as 8 p.m. -- when he would compete with Bill O'Reilly on Fox News and Anderson Cooper on CNN, among many other prime time options. In fact, "unclear" is the operative word for all of MSNBC at the moment, according to staffers there.